E-Defense Simulates Major Earthquakes – When and Where does the Building Begin Collapsing in an Earthquake? Posted on March 18, 2011 by daniellee803 | Comments Off on E-Defense Simulates Major Earthquakes – When and Where does the Building Begin Collapsing in an Earthquake? E-Defense is a 3D full-scale earthquake testing facility that simulates seismic activity on actual-size buildings. This facility is built by the National research Institute for Earth science and Disaster prevent (NIED) and has the world’s largest shaking table. It can hold a real concrete building and has 24 large cylinders with a diameter of more than 2 meters, which can simulate almost all kinds of earthquakes of any magnitude. Researchers can put actual-sized wooden buildings or oil tanks onto the table and observe to what extent does the structure stand against the quakes. Over the years, researchers can only observe what a building looks like before and after the quakes to determine and strength of the building. In other words, there is no way that one can observe the destruction of a building directly. Therefore, NIED built the E-Defense. This facility is capable of letting a life-size four storey concrete building (about 1200 tons) to experience seismic activity directly. The core of E-Defense is a huge and powerful shaking table. With a loading capacity of 1200 tons, it is considered to be the largest of the same facility type in the world. The E-Defense can move up to 50 cm vertically and 100 cm horizontally. It can also create a vertical acceleration of 1.5 G and a horizontal acceleration of 0.9 G. This shakes the 1200 ton building in three directions and is the first facility in the world to have such capability. Although the collapsing of buildings can be easily simulated by using a few computers, Japanese scientists think that actually observing the process of destruction is much more reliable. There are also many similar facilities around the world, but they use scale models to do the simulation. The materials used for the models do not completely resemble that of a real building, so the accuracy of the results is uncertain. Also, E-Defense is the only one that can shake up and down, back and forth, and left and right. Thus, NIED figure that it is necessary to build the new facility. Located on the Pacific Rim of Fire, Japan has a strict construction code for earthquake endurance. The E-Defense contributes greatly in understanding the quality and strength of concrete pillars and walls. Thus, shock resistance of buildings rises greatly and more lives can be saved. Comments Off on E-Defense Simulates Major Earthquakes – When and Where does the Building Begin Collapsing in an Earthquake? I started this blog a week ago and hesitated on finishing it due to the recent events in Japan. However I feel like this event has been an eye opener to how destructive our Earth can be. The reality is that this earthquake and tsunami has brought up questions to those living here in Vancouver and along the coast like “What would happen if an earthquake happened here?” I grew up in Winnipeg and I had been taught that a “big earthquake” was going to hit Vancouver. It has now been over ten years and nothing has happened yet. Is there still reason to be worried? Juan de Fuca Plate is the tectonic plate that subducting under the western side of the North America Plate. When people are concerned about the “big one” as in the “big” earthquake that will affect Vancouver, it will be due to this plate. The Juan de Fuca Plate is the smallest tectonic plate and is a remnant piece of the larger piece which is now has been subducted under the North America Plate. 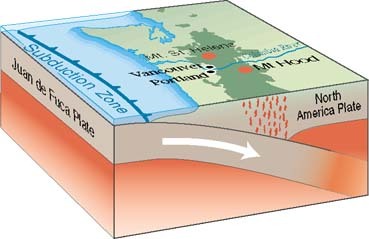 The area where this plate is subducting is referred to as the Cascadia subduction zone. Movement in this zone causes friction and results in earthquakes. The last major earthquake at this Cascadia subduction zone is thought to of created a tsunami that hit Japan in the 1700’s. This tsunami crested at 5 meters and would have taken about 10 hours to cross the ocean. The article from National Geographic on this theory can be found here. Kelin Wang of the Geological Survey of Canada said in this article that the chances of another large earthquake occurring along this same Cascadia fault is “100 percent.” This is due to the fact that plate movements have been locked which causes a build up of energy. A catastrophic earthquake would result when this energy is released. There have been some interesting quakes on the Juan de Fuca Plate. In 2008 there were 600 earthquakes in a 10 day span recorded by researchers at the Oregon State University. The part which caught the scientists by surprise was the fact they occurred in the middle of the Juan de Fuca Plate and not on a boundary. These were detected by a hydrophone. This is an image of the recorded earthquakes in B.C. in the last month.